CrossFit Competition Plyobox x2 – Complete! Just finished building my very first plyo boxes! At Everest Training Centres, we have recently been doing a lot of circuit training, as well as different Crossfit workouts. Box jumps are a regular request of these workouts, and I’ve been trying to help with the rehab of some athletes that require to develop leg power so it’s about time to have these. Not knocking Rogue Fitness (or any fitness supplier), but the cost of ordering plyoboxes online is just ridiculous if you are close to a Home Depot and have some handy skills. 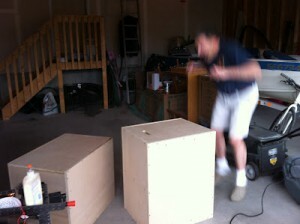 My boxes were built with 3/4″ maple plywood – 1 sheet per box – and used flooring screws for ultimate stability. Although it looks like an easy build, it was still a four power-tool job (skill-saw, drill/driver, router, and jigsaw). These boxes are obviously not the angled-stacking style (which can be better in case of slipping), but these are just more functional. These are to Crossfit competition regulation: 20″ x 24″ x 30″. The first took a few hours (to make a box, I know) to complete, but we were going on no plans, and wanted to make sure it was the most stable, and the most square. The second box took a mere 30 minutes. Total cost of the 2 boxes: sheets ($54.99 x 2) + screws ($7.99 x 2) totalled just about $120 after taxes. Pretty good seeing the cost from rogue would have been $161.60 + $35.50tax. Plus I got the chance to build something with my Dad. Quality time for the father’s day centre of attention. Thanks Dad, good times.